Consider Norlen Inc. The contract stamper, fabricator and assembler, established in 1964 and calling Schofield, WI, home, grew at a 26 percent clip in 2007 and is expected to maintain double-digit growth in 2008 and 2009. The supplier to nearly every major market except automotive achieves such performance by focusing on its core competencies: operational excellence, innovative solutions and human capital. Superiority in diverse production processes combined with well-trained, well-motivated personnel—120 employees across multiple shifts in 180,000 sq. ft. of manufacturing space—undeniably go a long in attaining these results, but innovative solutions, namely the deployment of technology and the use of automation to drive costs out of the business model, push the company over the top. Automation, claims Brillhart, is what enables Norlen to meet these customer demands. For example, the company employs robots, as part of an automation drive that began about three years ago, for part polishing, arc and resistance welding, assembly and material handling. Since 2005, Norlen’s sales have tripled while labor costs have dropped by 37 percent. Part of that focus on automation is formation of a robotic press-tending cell, where a 150-kg six-axis robot from KUKA Robotics Corp. USA, Clinton Township, MI, loads and unloads two presses—a 200-ton straightside and a 275-ton gap-frame model, both formerly hand-fed. “Demand is so great that we need this additional capacity,” says Brillhart, explaining the use of two presses in the cell. The presses are part of Norlen’s eight-press stable—five of those coil-fed—in capacities from 100 to 500 tons. The presses typically work with carbon steel in thicknesses from 18 gauge to 0.25 in., and also process 200-, 300- and 400-series stainless steels as well as some nonferrous alloys. About half of the stampings produced at Norlen ship directly to customers right off of the press lines while the rest route to inhouse value-added operations. Norlen also produces its own blanks in coil-fed presses, oriented in the robotic press-tending cell for pickup by the robot. 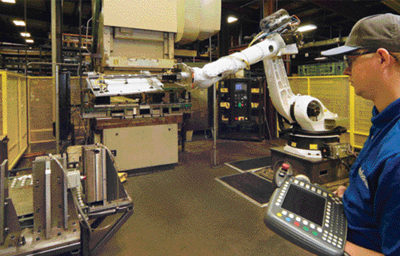 The company employs a variety of end-of-arm tooling (EOAT) on the robot, all of it produced inhouse. “Suction cups comprise the majority of our EOAT, but for some jobs we may need to grip a part and rotate it, so we also use grip-type tooling,” says Brillhart.Quick-disconnect coupling enables rapid changeout of the EOAT, which, along with other quick-die-change efforts, provides job-change shortcuts. That’s extremely important, according to Brillhart. “We are a low- to mid-volume production house, so changeover efficiency is a priority,” he says. “We will change part jobs 8 to 10 times in a day in this cell and run from 150 to 750 pieces per setup. So we can quickly change the EOAT, call up the job program and be ready to roll. As a result of our attention to quick job change, our changeovers now take only 18 to 22 min. from last part to first part. With business continuing to grow, Brillhart says the company plans next year to open another nearby facility that will complement current Norlen manufacturing processes and add some new ones at the request of customers. And Norlen will continue to focus on automation as a path to success.